Roughly chop macadamias, marshmallows and candy and place in a glass or stainless steel bowl. Add the toasted pistachios and cranberries and mix gently. Break the chocolate into small pieces and place in a microwave safe bowl. Microwave for approximately 45 – 50 seconds, then stir. Microwave for another 30 seconds then stir again. Repeat the process if necessary, until all the chocolate is evenly melted and has reached a relatively thin consistency. Pour the melted chocolate over the fruit, nut and candy mixture and mix well to ensure all pieces are thoroughly covered in chocolate. Pour into the prepared pan and then level with a spatula. Refrigerate for at least a couple of hours (preferably overnight), then remove from the fridge, place on a cutting board (the paper will be very easy to peel off) and cut into your desired shapes and sizes. This will keep very well for at least two weeks, though it will soften slightly at warm room temperature. 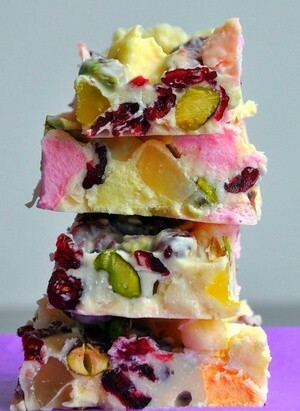 *If you require a longer shelf life for your rocky road or want to make this nut free, replace the nuts with different types of dried fruit or candy.